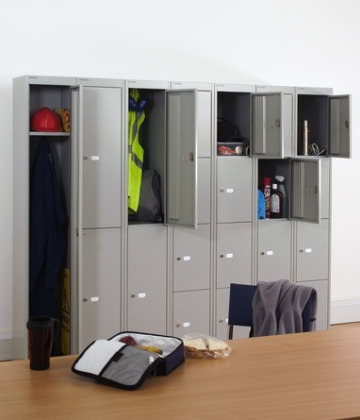 We provide metal lockers for staff and office storage to suit any workplace requirements. Our lockers are designed and structured to offer high capacity, secure storage of personal and company items for staff and visitors. Give your employees and visitors peace of mind knowing that their items are safe and secure during the working day in their own personal storage locker. Staff Lockers, storage lockers or workplace lockers; whatever you want to call them we have them. These amazing metal lockers will ensure your office stays looking tidy, efficient and safe. No coats on the back of chairs, no bags lying around as trip hazards; Just a single convenient place for everyone, from the warehouse through to the boardroom, to store their belongings. This keeps their personal items secure and keeps the workplace clean, tidy, uncluttered and most importantly safe from unnecessary trip hazards. Our lockers come in a selection of sizes and capacity, so depending on your workplace requirements we will have the solution for you. 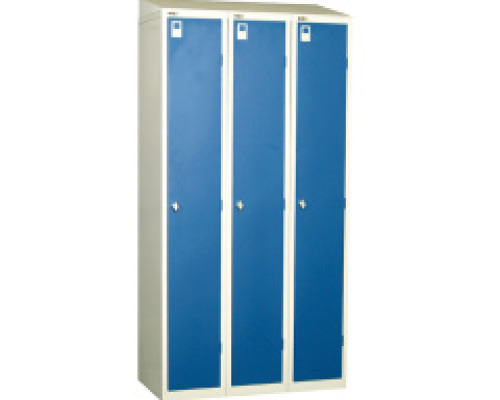 Short and deep storage lockers or taller and shallow staff lockers, we carry them all. If your team need a lot of room you can go for tall and deep office lockers with 2 separate compartments. If you do not see the solution you are looking for or for more information on our range please call and speak to a member of our team. What do I need to keep in mind when considering my staff lockers and office storage? When selecting your staff lockers there are only really 3 contributing factors to consider. The space you have, the capacity and contents that you need them to hold and the number of office lockers you require. By answering those 3 simple questions your lockers will jump off the screen for you, but if you are still unsure call us and we will guide you to the best solution for you. All of our lockers are eligible for our bulk buy discount on orders over 30 items, as well as our 30 day payment terms, give us a call for more information on either of these schemes. Fitting your lockers is pretty much a plug and play process, however if bought as part of a larger office installation or refit you may want to enquire about using our team to get these fitted. Click below to enquire or give us a call.